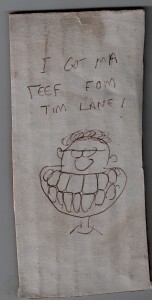 "I got ma teef from......... Tim Lane!" If you can’t think of something nice to say then make up something…something nice…and feel free to exaggerate. If you have some pics you’d like to share then post them (or email them to me and I’ll post them). ones just to fill out this page! Besides, we all know we’re only as good as our last case. We can’t treat today’s patients with yesterday’s laurels.